Thai AirAsia (TAA) is focusing expansion on secondary airports as Thailand’s largest low-cost carrier seeks to avoid intensely competitive trunk routes. TAA plans to open three new bases over the next year which will mainly be used to pursue expansion in the fast-growing Thailand-China market. U-Tapao Airport near Pattaya will become in late Sep-2015 TAA’s fifth base after Bangkok Don Mueang, Chiang Mai, Krabi, and Phuket. 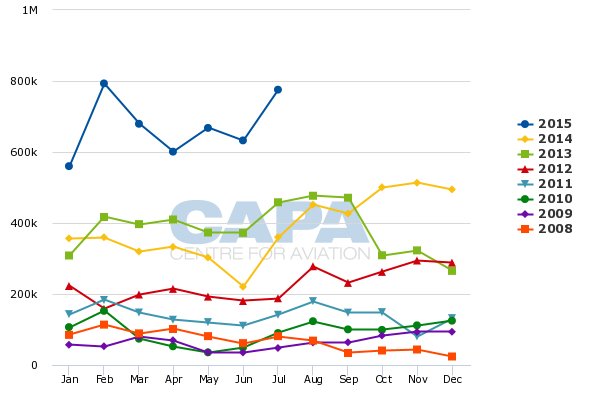 TAA is allocating its last two A320 deliveries for 2015 to U-Tapao, which will initially be linked with three Chinese cities along with Singapore and Chiang Mai. TAA plans to open two more bases in 2016 as it takes delivery of five additional A320s. All seven bases will have services to Greater China as well as domestic point to point routes, enabling visitors to bypass congested Bangkok while travelling around Thailand. TAA currently operates 30 international routes from four bases. Its main base at Bangkok Don Mueang includes 23 international routes to six countries – China (8 destinations), Cambodia (2), India (2), Malaysia (2), Myanmar (2), Vietnam (2), Hong Kong (1), Indonesia (1), Macau (1), Laos (1) and Singapore (1). TAA also currently operates three international routes from Chiang Mai (Hangzhou, Hong Kong and Macau), two from Phuket (Hong Kong and Singapore) and two from Krabi (Guangzhou and Singapore). Chiang Mai is the largest city in northern Thailand while Krabi and Phuket are popular beach destinations in southwest Thailand. TAA currently bases two A320s at Chiang Mai, two A320s at Phuket and one A320 at Krabi. It has 38 A320s based at Don Mueang. The Chiang Mai and Krabi bases opened in 2013. TAA is opening a base on 25-Sep-2015 at U-Tapao International Airport, which is located about 30km from the beach resort destination of Pattaya and about 170km from Bangkok. TAA plans to base two A320s at U-Tapao, including one aircraft which was just delivered and one aircraft which will be delivered in 4Q2015. The two aircraft will be used to operate four international routes from U-Tapao – including Hangzhou, Nanching and Nanning in mainland China and Singapore – and one domestic route (Chiang Mai). Thai AirAsia CEO Tassapon Bijleveld told CAPA on the sidelines of the 15-Sep-2015 CAPA LCC Airport Congress in Bangkok that all five new U-Tapao routes will be launched by the end of Nov-2015. He said the decision to open the base at U-Tapao was made after an analysis of the Thailand-China market discovered a large and increasing number of Chinese tourists were visiting Pattaya. The new flights at U-Tapao will give Chinese tourists an opportunity to start or end their holiday at Pattaya without having to fly to or from Bangkok. Tourists will also be able to visit Chiang Mai, another popular destination for Chinese visitors, before or after Pattaya without having to travel through Bangkok. Pattaya is located only about 150km south of Bangkok. But Don Mueang Airport is located north of Bangkok, making travel from Don Mueang to Pattaya inconvenient. U-Tapao is a much more convenient option for passengers heading to Pattaya and is also an underutilised and uncongested airport. AirAsia has already started selling flights from U-Tapao to Nanning and Nanchang. Nanning is located in the southern Chinese province of Guangxi and Nanchang is located in the southeast province of Jiangxi. U-Tapao-Nanning will be served with four weekly flights from 25-Sep-2015, decreasing to three weekly flights from 25-Oct-2015. U-Tapao-Nanchang will be served with three weekly flights from 26-Sep-2015, increasing to four weekly flights from 26-Oct-2015. Nanning is a new destination for TAA but AirAsia’s Malaysian subsidiary already serves Nanning daily from Kuala Lumpur. Nanning is also already served from Bangkok by China Southern, Nok Air and Orient Thai, according to data from OAG for the week commencing 14-Sep-2015. Orient Thai, a Thai leisure carrier which was recently purchased by Chinese investors, also serves Nanning from Phuket. TAA will become the first LCC – domestic or international – in the Nanchang market. Nanchang is currently linked with Bangkok by China Eastern and Orient Thai. AirAsia has not yet begun selling U-Tapao-Hangzhou. But it has identified Hangzhou as one of three Chinese destinations to be served from the new U-Tapao base and has included three weekly U-Tapao-Hangzhou flights on its online schedule. U-Tapao-Hangzhou could potentially be launched as a charter route before later transitioning to a scheduled service. Hangzhou is a much bigger market than Nanchang or Nanning. It is already served by the AirAsia Group from four cities including Bangkok Don Mueang (TAA), Chiang Mai (TAA), Kota Kinabalu (Malaysia AirAsia) and Kuala Lumpur (Malaysia AirAsia X). The Bangkok-Hangzhou market is also served by Chinese LCC Spring Airlines and flag carrier Air China. AirAsia has not yet begun selling or included in its online schedule flights from U-Tapao to Chiang Mai or Singapore. TAA has previously stated that its U-Tapao base will initially include three routes to mainland China, one other international route and one domestic route. Mr Tassapon confirmed to CAPA that these other two routes are Singapore and Chiang Mai. Singapore could prove to be a challenging route as Pattaya is not a very popular destination with Singaporean visitors. Singapore-U-Tapao was one of the first routes for Singapore-based LCC Jetstar Asia when it commenced operations in 2004. But the route was short-lived and was suspended in Mar-2005. TAA will become the first carrier to test out the Singapore-Pattaya market in over 10 years. U-Tapao-Changi Mai is sensible as it gives Chinese and other visitors an opportunity to travel from Pattaya to northern Thailand without having to go through Bangkok. TAA already links Chiang Mai with four domestic destinations in addition to Bangkok – Hat Yai, Krabi, Phuket and Surat Thani. TAA is keen to provide its passengers an option for travelling around Thailand without having to travel through Bangkok. Mr Tassapon said there is still room to expand at Don Mueang, particularly after the second terminal reopens in 4Q2015 following the completion of renovation project. But avoiding the congestion at Bangkok provides an attractive alternative for both TAA and its passengers. TAA sees point to point routes as an opportunity to avoid the congestion of Bangkok and turn around its aircraft faster. There is also generally no competition on point to point routes, providing an opportunity to generate higher yields and more revenues than a competitive route from Bangkok. TAA plans to continue focusing growth on point to point routes from secondary hubs in 2016. Mr Tassapon said TAA plans to open two more bases in 2016, including a second base in northern Thailand (after Chiang Mai) and a third base in southern Thailand (after Phuket and Krabi). TAA has not yet disclosed which airports will host its future bases but Chiang Rai would be most logical next base for northern Thailand. Chiang Rai is the second most popular tourist destination in northern Thailand after Chiang Mai. Airports of Thailand (AoT) is also keen to attract more international services at Chiang Rai, which currently only has one scheduled international route – a thrice weekly service from Kunming on China Eastern. In southern Thailand, Hat Yai would be the largest airport that does not have an AirAsia base. The AirAsia Group already has international services at Hat Yai with 10 weekly flights from Kuala Lumpur operated by its Malaysian subsidiary. AoT is keen to further build up the international offering at Hat Yai, which only includes flights to Kuala Lumpur and Singapore. Chiang Rai and Hat Yai would give TAA bases at all airports in the AoT portfolio except Bangkok Suvarnabhumi. But Hat Yai has relatively limited demand from China. Surat Thani is a more likely option for TAA as Surat Thani is an alternative airport for Koh Samui and other popular resort islands. AirAsia already sells Samui as a ferry connection via Surat Thani from Bangkok, Chiang Mai and Kuala Lumpur. The Kuala Lumpur-Surat Thani service is operated daily by Malaysia AirAsia. Surat Thani also now has international services from three Chinese carriers, including to Chengdu on China Eastern, to Shanghai on Shanghai Airlines and to Wuhan or Air China. Accessing Samui directly is not a possibility for AirAsia as Samui Airport cannot accommodate A320s and is not served by any LCCs. Samui Airport is owned by Bangkok Airways. Surat Thani is owned by Thailand’s DCA, which also owns Krabi and several smaller secondary airports which only have domestic services. Each new base for TAA will include international flights, most likely to China, and point to point domestic flights, further enabling visitors to travel around Thailand without having to travel through Bangkok. Each base is expected to be allocated two A320s – or a total of four of the five A320s TAA plans to add in 2016. TAA plans to add five aircraft per annum over the next three years. Most of the 15 additional A320s are expected to be allocated to five secondary bases – Chiang Mai, Krabi, U-Tapao and the two new bases that are to be opened in 2016. The Bangkok base is expected to see only modest growth while infrastructure constraints prevent expansion of the Phuket base. The strategy of focusing growth away from Bangkok is sensible given the competitive landscape in Thailand. Domestic trunk routes from Bangkok have become oversupplied and intensely competitive due to the rapid expansion of Thai Lion Air as well as capacity growth from TAA and Nok Air. International routes from Don Mueang are also starting to become more competitive as Thai Lion and Nok are now pursuing international expansion. Growing secondary airports and launching unique point to point routes is also part of the broader strategy at the AirAsia Group strategy. CAPA will look at expansion plans for secondary airports by other AirAsia carriers as part of a series of analysis reports on the AirAsia Group. As several of the primary airports in Southeast Asia become congested AirAsia sees opportunities at secondary airports, particularly if it succeeds at persuading secondary airports to reduce their charges, enabling the LCC group to stimulate growth. The AirAsia Group will continue to maintain a leading presence at its main hubs, including Bangkok Don Mueang, although the share of capacity allocated to these hubs will gradually be reduced. 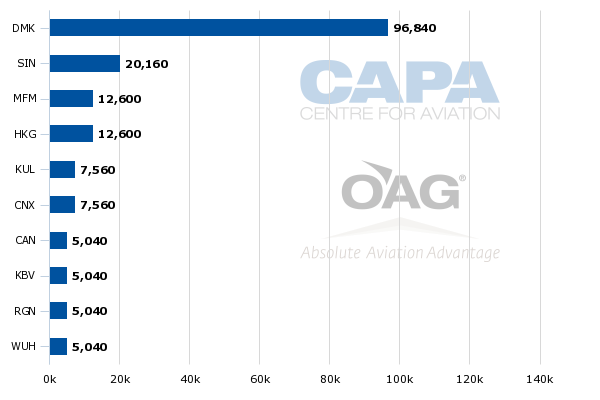 Currently 85% of TAA’s international seat capacity is from Don Mueang (DMK) compared to only 7% from Chiang Mai (CNX), 4% from Krabi (KBV) and 4% from Phuket (HKT). The four new routes from U-Tapao will also only account for about 4% of TAA’s international seats. TAA will also continue to allocate most its domestic capacity to routes from Don Mueang. TAA currently allocates about 90% of its domestic seat capacity to Don Mueang. It has 19 domestic routes from Don Mueang and competes with other LCCs in 18 of these markets. The eight largest domestic markets from Don Mueang have particularly become competitive as they are now served by Thai Lion and have also seen a significant increase in capacity from Nok and TAA. AirAsia is keen to stop expanding in these markets and focus primarily on international expansion, particularly from secondary hubs. TAA plans to slow down domestic expansion in 2016 and reduce its reliance on the domestic market, which now accounts for 65% of its total capacity. Where it does add domestic capacity TAA will seek out point to point routes which are not served by other LCCs. Chiang Mai-U-Tapao will become TAA’s sixth point to point domestic route bypassing Bangkok, joining Chiang Mai to Krabi, Phuket, Hat Yai, and Surat Thani and Phuket to Udon Thani. TAA plans to allocate most of its additional international capacity over the next year to China, with a focus on new routes from secondary airports. TAA expects more rapid growth in the Thailand-China market and is keen to leverage its position as the leading LCC between Thailand and China. Thailand reported a 108% increase in visitor numbers from China in 1H2015 to 3.8 million, which more than offset the decrease in 1H2014 caused by the civil unrest in Bangkok. The 17-Aug-2015 bombings in Bangkok have China and overall impacted visitor numbers for the latter portion of 3Q2015. But Mr Tassapon said the market has quickly recovered, providing a positive sign for the upcoming northern winter peak season. “The hiccup was about two weeks. All the forward bookings is back to normal now,” he told CAPA TV. TAA will have about 43,000 weekly seats in the Thailand-China market in Nov-2015 and Dec-2015, representing about a 90% increase compared to two years ago. The airline expects to further grow capacity to China in 2016 as China will be allocated a large share of its additional capacity. Long-haul sister carrier Thai AirAsia X (TAAX) is also preparing to launch its first route to China, Bangkok Don Mueang-Shanghai Pudong, subject to regulatory approvals. The Bangkok-Shanghai market is currently served by Thai Airways and four Chinese carriers – China Eastern, Juneyao Airlines, Shanghai Airlines and Spring Airlines. Shanghai would give AirAsia nine Chinese destinations from Bangkok (or 11 if you include the charters to Ningbo and Wenzhou). Malaysia AirAsia X already serves Shanghai from Kuala Lumpur. TAAX currently links Bangkok with Osaka Kansai, Tokyo Narita and Seoul Incheon. China will be TAAX’s next new destination. For 2016 TAAX is looking at potentially launching services to Australia, Iran and Europe as well as more destinations in China. TAAX’s fleet of A330-300s, which is expected to expand from three to five aircraft over the next year, will be used to serve destinations in northern and eastern China which are four hours or more from Bangkok. TAA’s A320s will continue to be used to serve destinations in southern, central and eastern China which are up to four hours from Bangkok. While China will be the main focus for international expansion, TAA is also planning to pursue expansion to India in 2016. TAA launched flights to Bangalore on 1-Sep-2015 and plans to add two or three new destinations in India in 2016. . “It will be parallel – China on one side and also India on another side – so we will bring more tourists into Thailand,” Mr Tassapon told CAPA TV. Bangalore became TAA’s second destination in India after Chennai. Both destinations are currently served with five weekly flights from Bangkok. 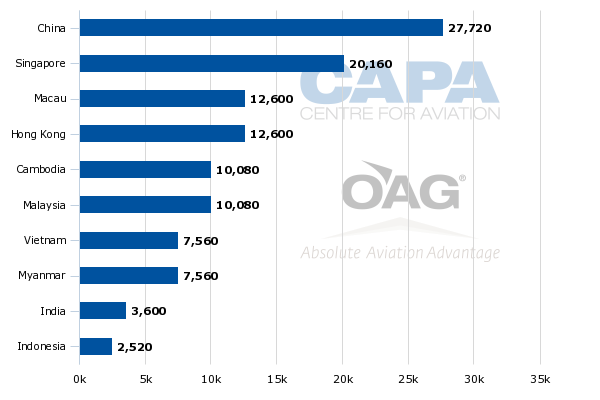 India currently only accounts for 3% of TAA’s international seat capacity compared to 46% for Greater China (includes Hong Kong and Macau) and 51% for other Southeast Asian countries. The new India destinations will likely be served from Bangkok while most of the China expansion will focus on secondary gateways. In 2016 China routes will likely be launched from Chiang Rai and Surat Thani as well as potentially more Chinese destinations from U-Tapao/Pattaya. China has emerged over the last year as an important market for the Pattaya tourism industry due to a sharp drop in visitor numbers from Russia, which has traditionally been the main source market for Pattaya. Flights from Russia and other CIS countries (primarily charters) have traditionally accounted for most of the passenger traffic at U-Tapao Airport, which is managed by Thailand’s Navy. But the Thailand-Russia market has been impacted by the economic crisis in Russia with Thailand reporting an approximately 50% drop in Russian visitor numbers for 1H2015. U-Tapao currently has scheduled services from only two airlines – AirAsia and Bangkok Airways. AirAsia’s Malaysian subsidiary launched flights to U-Tapao in Jul-2015 and currently serves the airport with four weekly flights from its Kuala Lumpur hub. Bangkok Airways has been the only Thai carrier with longstanding service in the Pattaya market. It currently operates two daily flights to U-Tapao using ATR 72 turboprops, including one from Phuket and one from Samui. Small Thai regional carrier Kan Air also entered the Pattaya market in Apr-2015, when it based a newly acquired ATR 72 at U-Tapao and launched flights to Bangkok Don Mueang (daily), Ubon Thani (four times weekly), Ubon Ratchathani (four times weekly), Khon Kaen (three times weekly) and Chiang Mai (three times weekly). But Kan Air suspended all five of these routes in Jul-2015 and is currently not operating scheduled flights at U-Tapao. TAA’s five new routes and base at U-Tapao should drive rapid passenger growth for the underutilised airport and provide a boost for Pattaya’s tourism sector. The new base will also serve as an important test for a new strategy at TAA – and the overall AirAsia Group – to stimulate growth at secondary airports throughout Southeast Asia.